Rebecca suggested making hot pickled peppers last fall when I was lamenting what to do with my huge crop. They are super easy, super good and will keep indefinitely. 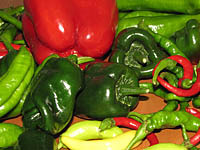 Pack a variety of small hot peppers loosely into a jar with a tight fitting lid. Cover with cider vinegar and store in the fridge. Peppers are ready after about 2 weeks and will keep indefinitely if they are well submerged in the vinegar. This is currently my favorite pasta sauce. If you already have roasted peppers on hand, it goes together in less than two minutes and the flavor is pure heaven if you like peppers. This recipe is adapted from the “Moosewood Restaurant Low-Fat Favorites” cookbook. Combine the roasted pepper and the buttermilk or yogurt in a blender and whirl briefly, being careful not to add so much buttermilk/yogurt that the sauce becomes thin. Add salt and pepper to taste. If it doesn’t taste rich enough, add a little good olive oil, then spoon over hot pasta. NOTE: You can buy roasted peppers from Claudio’s in the Italian Market OR you can make your own which tastes even better: Roast sweet red bell peppers over the flame on a gas range or broil till the skin is charred nicely. Wrap in paper towels and pop into a plastic bag to steam a bit while it cools down. When the pepper is cool enough to handle, use the paper towel to brush off the charred skin, then cut out the core and seeds and tear vertically into several large pieces. Use the paper towel to blot up any excess liquid. Stir in enough good olive oil to coat all the pieces and store in the refrigerator until ready to use (use quickly because it only keeps a few days). Wondering what to do with all those sweet and hot peppers which ripen in amazing quantities at summer’s end? Try this mix of whatever varieties you have and serve warm as a side dish or chilled as a condiment, as sandwich or taco topping — or tossed into warm pasta for a fast supper. * Hot and semi-hot peppers from the garden (I had serranos, poblanos, Thai super hots, Hungarian yellows, cayennes, Italian sweet marconis, and something called Italian Gourmet), adjusting quantities for the degree of hotness that you like. Core and seed all the peppers and cut into thick strips. Chop the garlic coarsely. Preheat oven to 400 degrees. Layer the chillis, bell peppers, garlic and olive oil in a shallow baking dish. Cover with foil and bake until the peppers are soft, 45 minutes to one hour. Uncover and continue to bake until the peppers are just slightly charred and very soft, about 45 minutes more. The oil from the peppers will mingle with the olive oil to make a lovely, beautiful preserve. Serve immediately or put in a container and add enough additional olive oil to completely cover the peppers. They will keep in the fridge this way for about two weeks. And don’t discard the oil after the peppers are gone — it is delicious in its own right.